I don't think I need to give much reason for the sparsity of posts this month other than that I am in full-time ministry and Holy Week is approaching. So, I thought, as I sit here on my couch watching golf and basketball this snainy Sunday afternoon, I'd check in with you and share a few things that have been on my mind. Jeremy Riddle's The Now and Not Yet. If you haven't listened to this album, and I mean really listened, you simply must! I have been absolutely blown away by Jeremy's songwriting (melody and words) and the overall production of this album. I know I just plugged it a month ago, but I have to say it again: It is incredible! There have been two occasions the past month that I have had the alone time (driving) to listen intently to the intricacies of the record. Both times, by the time I get to track ten, I am bawling my eyes out, completely overwhelmed by the Good News of Jesus Christ. This album is more than Christ-centered; it is Christ-consumed. It blazes with the Gospel. Holy crap! That's all I have to say about that. Who will believe this message? Who's been given eyes to see? Listen to it for yourself. It crushes me again even now as I write about it. If you have been listening to it, I'd love to hear your thoughts. Brother Sun, Sister Moon by John Rutter and the Cambridge Singers. This gorgeous choral and chant album was recommended to me by one of my music ministry members. He was reminded of it after reading my post on Chant. Although it was recorded in 1988, the pure vocal arrangements and sounds are timeless. The first half of the album is intended for morning use (Brother Sun), focusing on the Resurrection of Christ. The second half, then, is for the evening, particularly Compline (Sister Moon). I just listened to this for the first time today, and I'm very much looking forward to using it as an aid for prayer and meditation. On a more personal note, my wife and I are gearing up for the coming of our son, our second-born, who is expected to arrive May 9. Our firstborn, Lily, just got up from her nap, so I must go now and change her diaper. It is theologically inconsistent for a regenerate person to be non-charismatic. Therefore, I am a walking contradiction. Yes, I would unfortunately have to put myself in this category (at least one foot). Regenerate Non-charismatics are covered in layers of clothes that keep the Gospel from getting out. We are like Ralphy's little brother in A Christmas Story who is so tightly bound by his snowsuit that he cannot move. Regenerate Non-charismatics wear spiritual snowsuits of skepticism, dignity, formality, comparison, etc., that keep us from living the Gospel and truly worshiping God. Some of us have only ever known emotional and physical inactivity in our church lives, because we grew up in non-charismatic settings. Others of us have reacted against our charismatic backgrounds and have put on layers of bitterness and unforgiveness. We all bring our ideas of what is "acceptable" activity into the church. To reiterate, in my attempts to redefine "charismatic" I am working off of the assumption that what gets into our souls affects our bodies, because there is a miraculous unity between the two that make us one whole being and not two separate persons. Regenerate Non-charismatics epitomize the improper dichotomy of body and soul. But in reality, whether we believe it or not, we are still whole persons, and what should affect us emotionally and physically, we often suppress with fear and doubt and all kinds of sin. For whatever reason, non-charismatic churches tend to be of the more biblically faithful sort, at least in terms of preaching sound doctrine. Perhaps our mental ascensions lift us right out of our bodies up into what we deem the spiritual realm, where worship can be purely offered. This is an unfortunate thing, separating spiritual knowledge from our bodies, essentially denouncing our bodies as unimportant and hindering to our relationship with God. I don't get it; the preached Gospel is ever present in so many of these churches, and yet the people remain physically dead, not only in church, but in their entire lives of worship. Is not the Gospel the most powerful message in all the world? How could we sit unaffected? Well, it's our clothes of sin. It must be. Christ is present, and He is the constant. We are the variables who refuse to be filled with the Spirit. Could it be that Paul's exhortation in Ephesians 5 is something we can determine in our hearts to do: "Be filled with the Spirit, addressing one another in psalms, hymns, and spiritual songs, singing and making melody in your heart to the Lord"? I mean, if we are regenerates, then we already have the Spirit. Are we still waiting for the Spirit to come, and then we'll have a revival? There is nothing worse for a worship leader than to respond to the Gospel by passionately pouring out your heart before the Lord in song among a group of seemingly unaffected people. Not that the Lord isn't doing something in their hearts, and not that we measure our effectiveness based on their physical expressiveness, but it just stings. It's like unsuccessfully karate-chopping a piece of wood. We are so consumed with all of the other things we worship in our lives that the Gospel becomes powerless to us. We must stir up our souls. We must wake up as the Church and act upon the most powerful event in the world. It's natural enough for us to let it all hang out when we're with our buddies watching a football game. How much more should we become undignified in the presence of God, not merely sitting on a couch spectating an entertaining event, but actively participating by playing our role in the greatest event the world has ever known: the life, death, and resurrection of Jesus. Our worship reflects what we believe. Do we really believe in Jesus? In sum, Regenerate Non-charismatics don't make sense. It is illogical for an alive person not to be filled with grace and life. We are covered in worldly clothes that keep us from unabashedly responding to the Gospel. We must wake up and live the grace-filled Gospel life. 1. Worship Arts (Singing Christ) - Worship Arts include all kinds of creative expressions of worshiping God, such as singing, dancing, acting, painting, etc. Since singing dominates our artistic worship expressions, I will use it as the primary example for our purposes. Singing is a natural human response to soul stimulus. God made us this way. He even sings over us out of His love for us. It is part of the Imago Dei in each of us. Music should be an important part of every church; the Bible tells us so (Temple worship, Psalms). Music, however good it is in and of itself, is not an end in itself. Music is a servant. It serves us, we do not serve it. It serves our worship of Christ. It serves us on Sundays when we gather to celebrate the Gospel. It serves the unified Church in various ways as we embody the Gospel. And it ought to serve Christ to the whole world as God's Kingdom is established on earth as in heaven. At least that is what music was created for, as was every good thing: the glory of Christ. 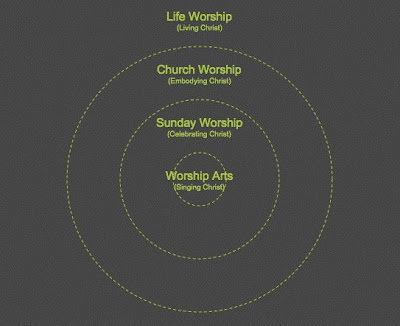 So, the diagram represents Worship Arts (or singing) as the epicenter of my duties. It, however, is the servant of all the other levels of worship. And no matter how far I try to run from the responsibility, music does preoccupy a significant chunk of my time devoted to ministry. 2. Sunday Worship (Celebrating Christ) - It is important to note first that Sunday Worship does not serve the Worship Arts. Where the Contemporary Church has erred in large part is by exalting music to be the master of Sunday Worship. Art is exactly what it implies, created. We would be like the Romans if we were to worship the creature instead of the Creator. And while Sunday Worship (Word and Sacrament) rules over the Arts within it, Sunday Worship submits to greater Church Worship and of course Life Worship. Some would say that the Divine Liturgy (gathering to celebrate the Sacraments) is the absolute most important thing we do in life. Maybe it is, maybe it isn't. I'm not sure. I would argue with certainty, however, that Sunday Worship is a smaller part within a greater metaphysical existence, the Church, the body of Christ. Additionally, it submits to the ultimate purpose for all things, the glory of Christ as the Church lives the Gospel. We pour more of our time and resources into Sunday Worship than anything else we do as a church. What does this say about us if Sunday Worship might actually be less important than both Church Worship (discipleship, simply being the church) and Life Worship (living Christ in all of life)? I am happy to say that our church is moving away from being a Sunday only church, and is making progress towards building into the life of our community through more intentional discipleship and home groups, while the leadership is under significant conviction to model prayerfulness and living the Gospel in all of life. 3. Church Worship (Embodying Christ) - This is the most difficult form of worship to put my finger on. In fact, until I began really thinking deeply about this model, I had never included this as a level or worship. It seems to me to be dealing with something invisible, perhaps a mystical bond that unites all of us individuals together as the Church. It deals with existence, or being. Yes, each of the other levels can be seen and touched. Embodying Christ is pure community, something I am learning more and more about these days. Church Worship is about being the Church, not being churched. It's not even so much about doing church, which the other levels are concerned with to a degree. Being the Church is not so much an action as it is an existence. And so our worship at this level is quite other-worldly. It's kind of like the part of the Kingdom that has yet to come, or like us ascending to the throne room as God's children. It's hard to envision how God sees us, but we can be certain that he sees us as a perfect community gathered together as one in Christ. On a practical level Church Worship is about discipleship. It's one thing to go to church on Sunday, and that's the end of it. It's an entirely other thing to begin getting connected to the body of Christ through deeper teaching and intimacy with one another. This level of worship, in my estimation, rules over Sunday Worship and the Worship Arts, which both then serve greater Church Worship. The only level of worship that it submits to then is Life Worship. 4. Life Worship (Living Christ) - If someone were to ask me what is my definition of worship, I would simply answer, "Living Christ" or "Living the Gospel." I believe this is the highest level of worship. This is what Paul is talking about in Romans 12:1-2; in light of who God is and what He has done for us, we gladly offer our entire lives (body and soul) in the service of Christ. Life Worship is proclaiming the Gospel at all times, in our thoughts, actions, relationships, in everything. This seems to be our purpose for eternity. Preaching the Gospel is not just a necessity for evangelism, winning people to Christ. Preaching the Gospel is pure worship. It is re-enacting the life, death, and resurrection of Jesus. Every time we recount God's love and genuinely express our love for God in song, we are preaching the Gospel. When we gather together to Celebrate the Lord's Supper, we are preaching the Gospel. Simply existing as the community of God is preaching the Gospel. Preaching the Gospel is Living Christ. It is everything glorious and perfect being lived out by the Spirit in us. It is Christ reflecting the Father's love through us. I long for this understanding of worship to permeate the minds of church leaders and worship leaders today. None of the other levels of worship makes sense without this all-encompassing level. It's hard to even count this as a level, because it is so infinite in purpose and glory. The question is, how do we live this and teach it to those in our churches? What do we worship leaders put in our job descriptions to start putting forth the time and effort in transforming our worship culture to live and breathe the Gospel in this way? Imagine if our definition of worship started from the top down, instead of from the bottom up. Do you think the Church would begin to look different if instead of beginning with music (the Arts) to define worship we started with Life Worship? The more I think about it, the more I agree with Dr. Harold Best that it would serve the Church well to remove the word "worship" from our vocabulary for a good decade. Our contemporary understanding of worship has messed us up something fierce.